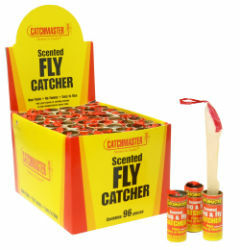 Specially formulated and lightly scented, these bug and fly catchers are for household and farm use. Simply unroll and hang to control flying insects. The Catchmaster® adhesive attracts flying insects to the ribbon where they are caught. Thumbtack is included for hanging. Ready to use and Disposable. Non-toxic. Indoor and outdoor use.